"Humble workers and eminent industrialists united in Coventry Cathedral this week to honour in a Memorial Service the great man who embodied them both - Sir Alfred Herbert. The tribute of little women pensioners who came from the homes he provided for them in Lady Herbert's Garden, and the tribute of the company directors from the length and breadth of the land would have been of equal value to Sir Alfred. One line in one hymn stood out in the whole service provided food for thought by those who loved and those who honoured him. It was 'Beauty for ashes of the vanished years'. Besides being a man of faith, Sir Alfred has left much behind to show for the vanished years. The quiet works of this generous man were enumerated by the Bishop, Dr Cuthbert Bardsley. Some had never been heard publicly before; all had been done in an unostentatious manner. As the bishop spoke, a few yards away men worked on Coventry's glorious new Cathedral, answering a request for silence in such a way that not a sound disturbed the simple service - building quietly for the future as Sir Alfred had, yet paying their respects to him as he had to his employees and fellow men. 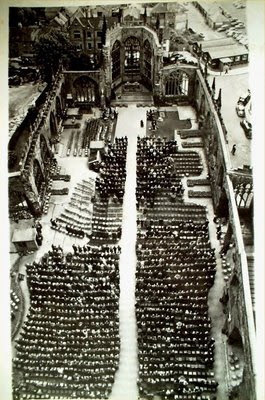 Twenty-six stewards, employees of Sir Alfred Herbert Ltd, conducted the 2000-strong congregation to their seats in the Cathedral under a grey sky. Many were there an hour before the service started and sat in a cold wind to pay their tribute. Others had travelled hundreds of miles for the occasion. The service was relayed to Holy Trinity, where the organ music for both services was played by Mr L Tanner. Mr David Pugh, son of Lady Herbert, read the lesson from Revelations, and the service was conducted by the Provost, the Very Rev. RT. Howard. The Bishop was preceded into the Cathedral by the Coventry Cross, born by Mr Raymond Lucas, and employee of Sir Alfred Herbert Ltd. Brother Ronald; the Rev Ian Miller, Vicar of Foleshill, and the Rev RM Spurin, the Foleshill curate who are works chaplins at Sir Alfred Herbert; the Precentor of the Cathedral, the Rev JH Proctor; the Rev Lincoln Minshull, Superintendent Minister of the Methodist central hall; the Provost of Coventry, Canon E Moore Darling, Canon Missioner in the Coventry Diocese. "A man who did much good in his lifetime". Thus Coventry's Lord Bishop described Sir Alfred. He said: "it isn't easy to be rich and a good man. The temptation of the wealthy man is to retire from creative life to live an entirely selfish existence. "Not so Sir Alfred Herbert. He could have retired years ago and enjoyed himself. But he didn't; right up until nearly the end he and Lady Herbert would travel up to the factory each week. He could have ceased to take any interest in in the men in his factory. He had plenty of money with which to live in luxury. But no. He thought and cared and planned and suffered right into his eighties with those men with whom he had worked so long. He did not regard them as his employees as much as his friends. 'Sir Alfred', stated the Bishop, 'was a man who did good with his money and his mind. Just as money could be used for good or ill, so could the mind.... Sir Alfred had a brilliant, scientific mind aligned with a perhaps still more brilliant administrative mind. To you men who have lost a 'boss' - a greatly respected and almost venerated boss - our hearts go out in sympathy. To his wife and family who mourn the loss of husband and father, we extend our deep compassion. But your sorrow should today be tinged with pride that it was your privilege to know and serve and love a very great man, a prince among men, a good man, full of the Holy Ghost, and of faith. May his soul rest in peace and let light perpetually shine upon him." Family and Principal Mourners were: Lady Herbert, Miss U Tidd (private secretary), Mr and Mrs AO Hollick; Mrs J Vapenick; Major and Mrs W Allen; Mr and Mrs DWAH Allen; Mr and Mrs I Hollick; Mr and Mrs J Pugh; Mr I Pugh; Mr D Pugh; Mr and Mrs P Lawford, Mrs RS King Farlow; Mr D Bankes-Price; Mr H Piper [chauffeur]; Mr EH Busby [chauffeur]; Mr J Crouch [butler]; Mr G Price; Mrs A Stanley; Miss E Hoffa; the Lord Mayor of Coventry, Alderman Mrs Pearl Hyde; the Town Clerk, Mr Charles Barrett; the Deputy Mayor, Alderman HHK Winslow; and the Chief Constable, Mr EWC Pendleton. Thereafter a list of all those who attended - four columns of names. Click here for more photos of the memorial service as well as his burial at Litchfield.